Patio doors will become hard to close after a time. The solution may be the rollers need to be replaced. This is simple enough to fix , once you can get your hands on the correct replacement rollers. That's where we come in, we are specialist suppliers of all such things, window and door hardware. Have a look at our web site www.emhardware.ie and see what we can do to sort your problem just like we have been doing for more then 25 years. Across is a photo of a common set of old worn aluminium sliding door rollers that we recently replaced with new for one of our customers. There are six or eight commonly used door roller in use in Ireland, we stock these, and we offer our specialist supply to order service for all others. This normally take no more then four working days. 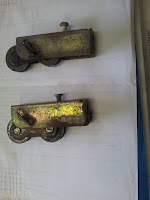 Open your sliding door and lift it off, turn it upside down and check the rollers, if they are corroded or worn, take them off and give us a call, we will ask you to photo the worn out rollers and email us a few pictures. We will send you the correct replacements after you pay over the phone. If you can't get started we will advise you on how to proceed. Your door will slide smooth and sweet once more for very little in repair effort, just call us and ask for John. You need to talk to someone who knows how to help, and won't wast your time and send you the wrong product. We sell all manner of handles and locks to suit all sliding doors and much more. Check out www.handlesupplies.ie for the world of our door handles. Our warehouse store is open six days a week to all customers. Patio doors will become hard to close after a time. While the idea of fixing them and saving a few bucks in the process sounds nice, sometimes you just have to go ahead and replace them than have to worry about it sticking or malfunctioning every so often. In the long run, it might even be more beneficial to you financially and time-wise. Not to mention all that effort saved on trying to fix it over and over again.